The prevalence of morbid obesity is growing worldwide at a high rate. Gastric bypass surgery has been recognized to be one of the effective long-term therapy for morbid obesity. Undergoing Gastric Bypass weight loss surgery does carry a certain degree of risks and various complications. However, patients can minimize complications by following the dietary and post-surgery path as dictated by both your surgeon and dietician/nutritionist. The learning curve for gastric bypass operation is steeper than lap band and gastric sleeve. The more extensive a bypass surgery is, the greater the risk for nutritional deficiency as well as complications. Ultimately, patients with extensive surgical process require the closest monitoring and may need medications for the rest of their life. Nearly 10-20% of patients who have weight-loss surgery require some follow-up to operate to correct complications, they report. 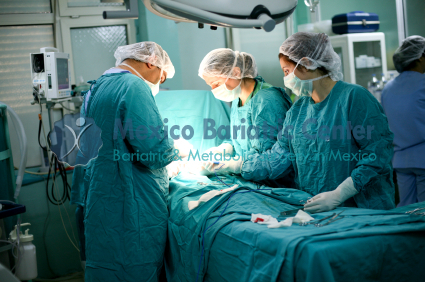 The risk of gastric bypass complications is lower at centers like Mexico Bariatric Center that do more than 100 bariatric surgeries per year (SOURCE: WebMD and MBC Research Study). Perhaps the most common complication is a Hiatal hernia. A hernia is known by any instance where a body part inside the body pushes somewhere it shouldn’t. The hiatus is the diaphragm opening or the muscle wall that separates the chest cavity itself from the abdomen. The proper digestive process involves food moving through the esophagus through the hiatus and into the stomach. However, when a hiatal hernia occurs, the stomach bulges up into the chest. There are two types of Hiatal hernias, paraesophageal or sliding. A paraesophageal hiatal hernia, a portion of the stomach squeezes through the hiatus. Most of the time this kind of a hernia has no symptoms, and it can potentially shut off the blood supply. In the most ordinary kind of a hiatal hernia, the sliding, the stomach and some of the esophagus slides with the stomach into the chest through the hiatus itself. Research studies show that patients after laparoscopic gastric bypass and mini-gastric bypass surgery should take high-protein food and drinks in combination with alcohol drinks and exercise to avoid a low hemoglobin (Hgb) level. According to West Penn Allegheny Health System, the mortality rate for gastric bypass is less than .03 (or 1 in 300 patients). Regarding complications, nearly 5% of patients who have Gastric Bypass will experience some complication (about 1 in 20 patients). It’s important to perform surgery with a bariatric surgeon who has enough surgical experience who can make the appropriate-sized connections. Because gastric bypass surgery is a complicated procedure requiring many small millimeter-sized incisions and attachments, it’s important to go surgeon skilled enough do perform the proper surgical technique. Sometimes, when the intestine is attached to the new stoma, the doctor can make the opening too big, causing too much food to ‘bypass through’. Blood clots (see Deep Vein Thrombosis and Pulmonary Embolus, which both can cause death. One of the major unpleasant complications is dumping syndrome. Dumping syndrome occurs when a patient eats foods that are sugary, which passes too fast through the bowel. The body in an attempt to dilute the sugar will flood the intestines, which will cause dumping syndrome symptoms such as nausea, vomiting, and diarrhea. Ultimately, more than one-third of patients who undergo gastric bypass surgery will develop gallstones, according to Cleveland Clinic. The risk for them rapidly increases with fast, substantial weight loss. Gallstones can be prevented by taking bile salts as a supplement for up to six months following surgery. Approximately 30% of Gastric Bypass patients will develop a nutritional deficiency such as metabolic bone disease, anemia (Iron deficiency) or osteoporosis. They can be avoided if the proper vitamins and minerals are consumed following surgery and daily. Ulcers – Ulceration at gastric side or the jejunal side of the anastomosis is a common complication. It is occurring in approximately 20% of of RNY Gastric Bypass patients. The symptoms is often associated with pain, vomiting & nausea, food intolerance, and bleeding. Complications, such as Ulcer, can be managed Endoscopically after gastrointestinal weight loss surgery. It’s important that women avoid pregnancy for up to two years when their weight is more stabilized. This is because rapid weight loss can lead to nutritional deficiencies that can harm a developing fetus and the chance of a successful pregnancy. More patients will face severe or slight complications after bariatric surgery. Most of the complications incur as a result of a patient’s diet. A multivitamin that includes a minimum of 18 mg of iron, selenium, zinc, copper and 400mcg of folic acid. Take two of these a day for at least three months following surgery, and then just one daily. Take 1,200 to 2,000 mg of calcium each day. To enhance the chance of absorption, take it in two or three doses throughout the day. Take 800-1,000 IUs of Vitamin D. Divide the dosage into two doses. Take it with the calcium supplement. Take 500 mcg of Vitamin B. To reduce the number of complications, all gastric bypass patients should consume nutritional supplements as detailed from their surgeon, dietician or nutritionist.